The particular junction field-effect transistor, or JFET, model used in this experiment is not critical. P-channel JFETs are also okay to use, but are not as popular as N-channel transistors. 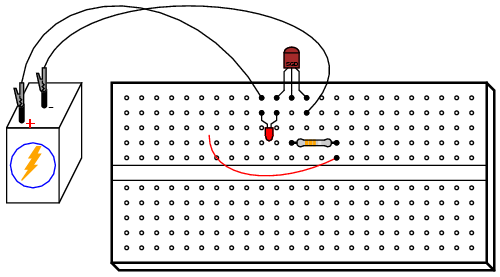 This experiment is very similar to the previous experiment using a bipolar junction transistor (BJT) as a switching device to control current through an LED. In this experiment, a junction field-effect transistor is used instead, giving dramatically improved sensitivity. Build this circuit and touch the loose wire end (the wire shown in red on the schematic diagram and in the illustration, connected to the 100 kΩ resistor) with your hand. Simply touching this wire will likely have an effect on the LED's status. This circuit makes a fine sensor of static electricity! Try scuffing your feet on a carpet and then touching the wire end if no effect on the light is seen yet. For a more controlled test, touch the wire with one hand and alternately touch the positive (+) and negative (-) terminals of the battery with one finger of your other hand. Your body acts as a conductor (albeit a poor one), connecting the gate terminal of the JFET to either terminal of the battery as you touch them. Make note which terminal makes the LED turn on and which makes the LED turn off. Try to relate this behavior with what you've read about JFETs in chapter 5 of the Semiconductor volume. The fact that a JFET is turned on and off so easily (requiring so little control current), as evidenced by full on-and-off control simply by conduction of a control current through your body, demonstrates how great of a current gain it has. With the BJT "switch" experiment, a much more "solid" connection between the transistor's gate terminal and a source of voltage was needed to turn it on. Not so with the JFET. In fact, the mere presence of static electricity can turn it on and off at a distance. To further experiment with the effects of static electricity on this circuit, brush your hair with the plastic comb and then wave the comb near the transistor, watching the effect on the LED. The action of combing your hair with a plastic object creates a high static voltage between the comb and your body. 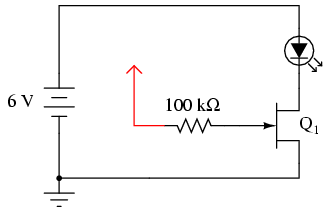 The strong electric field produced between these two objects should be detectable by this circuit from a significant distance! In case you're wondering why there is no 560 Ω "dropping" resistor to limit current through the LED, many small-signal JFETs tend to self-limit their controlled current to a level acceptable by LEDs. The model 2N3819, for example, has a typical saturated drain current (IDSS) of 10 mA and a maximum of 20 mA. Since most LEDs are rated at a forward current of 20 mA, there is no need for a dropping resistor to limit circuit current: the JFET does it intrinsically.